It’s only the start of the New Year and 2017 … but… are you halfway to quitting already? 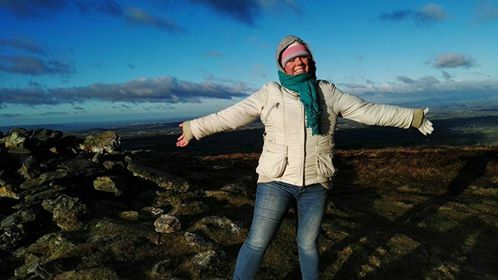 New Year’s Day and I decided to walk up to the top of Mount Leinster. From there you can see five counties I am told. I was enthusiastic setting off but when I parked and stepped out of the car the wind nearly carried me off the nearby cliff. I struggled on determined to get up that hill, but the wind was fierce! By the time I got half way my ears were throbbing, my chest heaving and my cheeks were burnt with the wind. I sheltered behind a boulder and thought about turning back. It was VERY cold! But I didn’t. I buried my head in my scarf, tucked in my chin and marched on. In fact after that point it got easier and the wind seemed to ease a little. I thought to myself mmm what’s the lesson here? The half-way point can sometimes be the hardest. This is when your mind starts playing tricks with you – sabotaging your attempts. ‘Sure what’s the point?…Why bother? It’s waaaay too cold!’, it cries. Want to achieve something this year? Have a New Year’s resolutions in mind? Then…. visualize the end result – imagine the reward with all your senses. And the biggest tip…. what is your WHY? My ‘why’ is to really FEEl ALIVE. To feel like I have done my best and been present along the way. To have no regrets and to live a life of integrity and purpose. This is what makes me truly feel good. This is my New Year’s resolution. To break through my own self imposed limitations and to keep growing stronger and stronger. To step outside my comfort zone. P.S: Want some help in getting there? Join us on the next Blackbelt MasterMind Bootcamp in Dublin in February HERE!